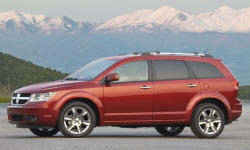 Dodge Journey Safety & Braking Pros and Cons | Page 1 of 1 | Why Not This Car? What drives people to buy (or not buy) a certain car? TrueDelta's members share Dodge Journey pros and cons based on their real-world driving experiences. All around driver and passenger side curtains air bags. Multipe airbags and even towing anti-sway control. It has good safety ratings and drives/handles well in the snow. High safety rating for its class. Brakes are very good.